I really like Civilization VI! 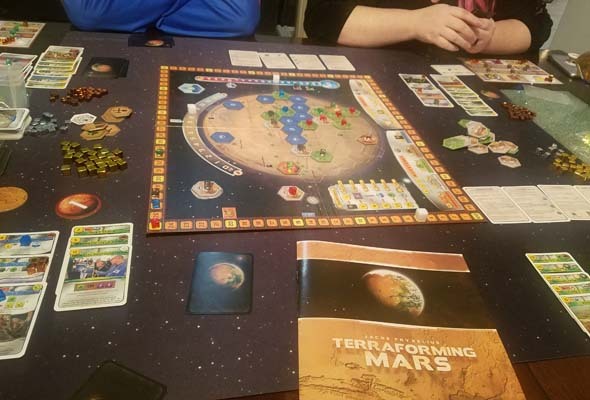 Of course, it has its share of nagging problems (some of which have been resolved already) - any game of this size and scope is likely to have issues at release. 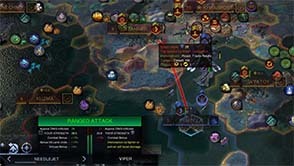 I've already been thinking of some ideas for how the game could be improved in expansions and DLC, and I'd like to spend a few posts to share some of those ideas with you now. 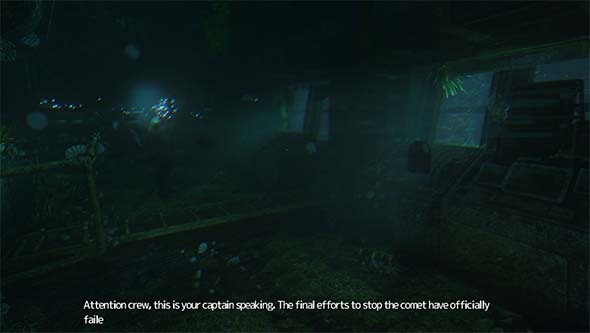 In my review of the game, I mentioned that oceans feel like they've regressed a bit since Beyond Earth: Rising Tide, in that they've returned to feeling like lifeless dead space on the map. Even though they're more important for Holy Sites and Campuses, mountains are also still mostly dead space on the map. They act as obstacles, and that's basically it. In expansions and DLC, I would like to see some of this space become more alive and useful. I'd like to spend this first suggestion post going over some ideas that I have for expanding the ocean mechanics, and for taking advantage of more of the map's dead space. Feel free to discuss through the comments on this post, or via the linked forum topic! I'm very underwhelmed with coastal cities right now. Water tiles have very little utility. 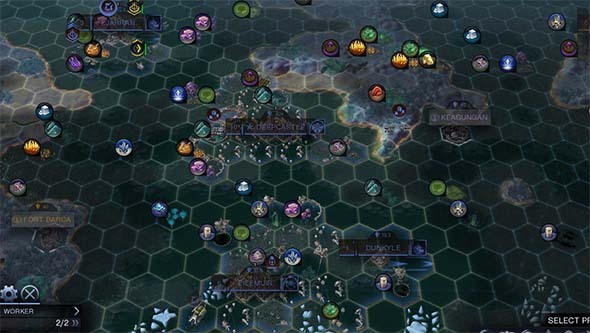 They provide small yield, can't have districts (other than a single harbor per city), and generally lack production. Coastal cities with lots of water are, thus, very unproductive and not really worth building. I think there's a couple ways to resolve this. 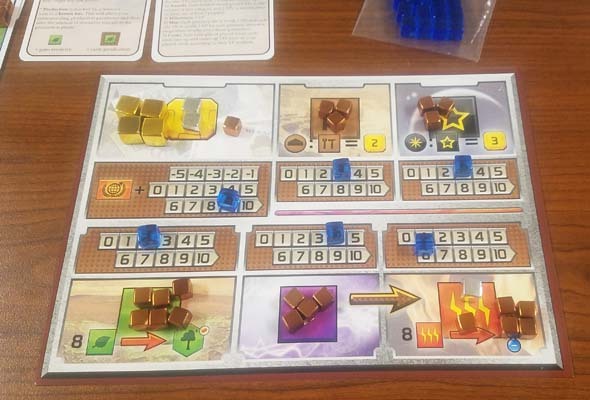 Harbors could provide a small amount of production. 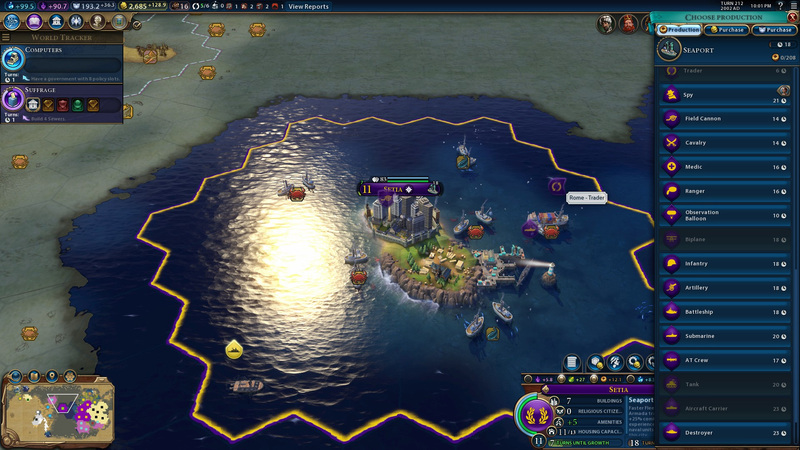 Or perhaps Harbors could act similarly to lighthouses from Civ V and provide production on sea resources. 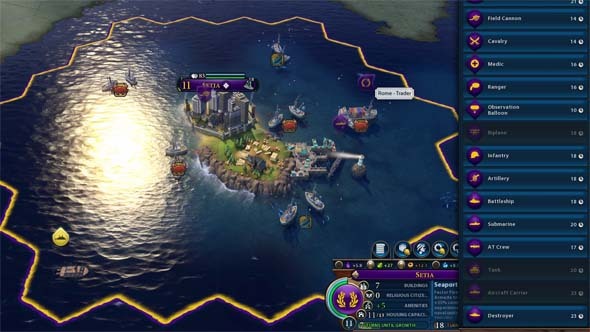 Or they could provide production on all adjacent sea tiles (so that placement is still important, and more of those empty sea tiles become useful and worth working, and you actually have to work them in order to get the benefit (as opposed to the Harbor just having an adjacency bonus). 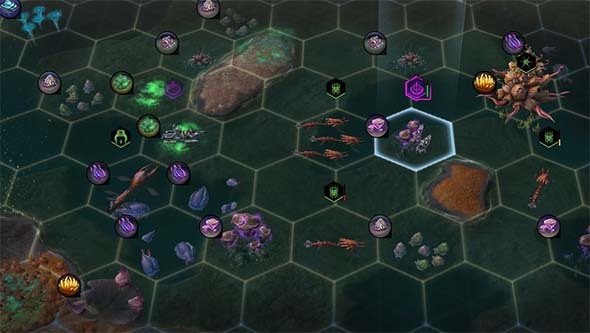 If we want to only use adjacency bonuses, then another alternative might be for Harbors to provide +1 production per adjacent coastal resource and +0.5 gold per adjacent water tile. That way, even cities that don't have clustered water resources can still have valuable locations for harbors. Coastal and island cities lack production and have limited space to build districts. Another way to improve coastal cities would be to have some more early policies that benefit coastal cities. Perhaps the Maritime Industries policy could be changed to "+1 production in coastal cities, and +1 production from Harbors". Alternatively, Maritime Industries could be similar to the Veterancy policy, and it could provide "+33% production towards Harbor districts and buildings for that district". Or we could have policies that do both! A new policy could be added that provides the bonus production for early naval units. 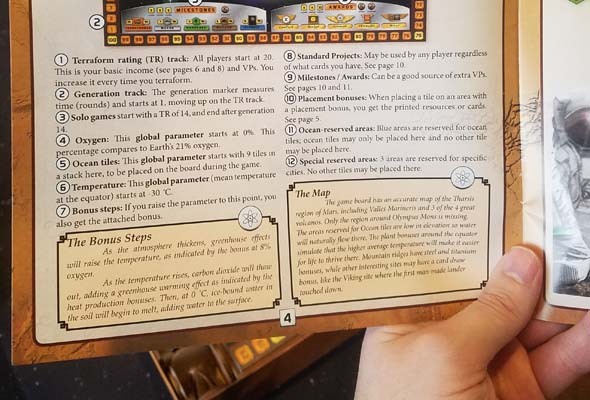 Maybe there can even be a whole extra early-game civic (maybe called "Seafaring" or "Way-finding") that has some policies and buffs towards coastal and island civilizations. Now that I've gotten through the gauntlet of massive AAA releases like Metal Gear Solid V and Dark Souls III, I wanted to take some time to clear out some smaller games that have been collecting dust in my Steam library before diving into any other massive, time-sucking games. One of my highest priorities was the Indie sci-fi horror title Soma, developed by Frictional Games - the same company that made Amnesia: the Dark Descent. I had heard pretty good things about this game, and I liked Dark Descent, so I was eager to finally have a chance to dive into this one. Soma show signs of learning from the weaknesses of both The Dark Descent and A Machine for Pigs (which was actually developed by a third party), even though it still doesn't necessarily nail the mechanics this time either. It's a far better experience than Machine for Pigs, and shows the level of quality that helped make Dark Descent such a hit. 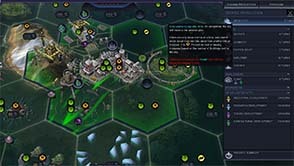 The most notable improvements from Machine for Pigs is in the depth of gameplay and monster encounters; and the most notable improvements from Dark Descent are in puzzle design and narrative. Monsters sometimes appear in where you get important story bits to incentivize you to not just walk away.